Atlanta, Georgia isn’t only a terrific place to live, it’s also a great place to work, as well. Many of North America’s top companies know this, so they’ve chosen to place their headquarters in Metropolitan Atlanta or one of the surrounding communities. There are also several top employers located in Atlanta that only serve the local population, including local hospitals and universities. If you’re new to the Atlanta area or are relocating to the city for a new job, you may not know what to expect from your daily commute. And, commute times in the Atlanta area can vary. In this handy guide, we’ll look at the commute times from some of Atlanta’s most popular neighborhoods to many of the area’s top employers. It’s probably no surprise that many of the Atlanta-area’s largest employers are based in the central part of the city. 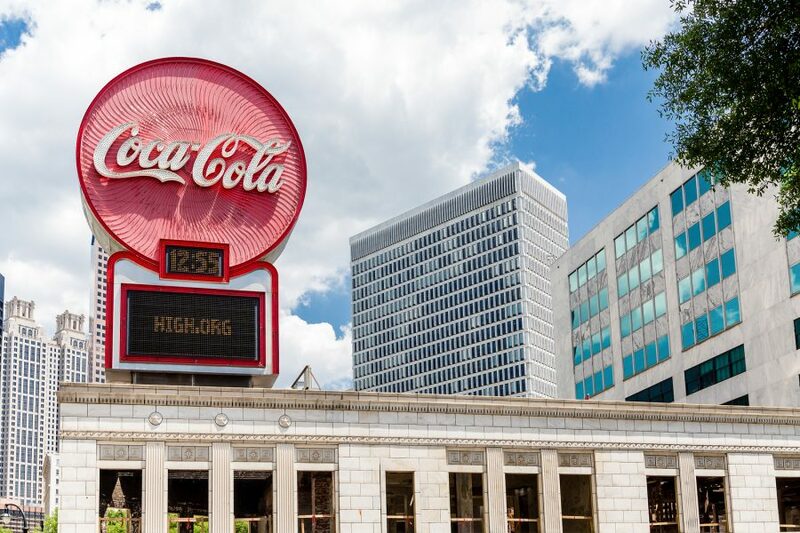 Coca-Cola’s world headquarters, the Southern Company, Georgia Tech and Georgia State Universities, and Delta Airlines are all based in downtown or nearby. Commute times to the downtown Atlanta area are some of the longest in the region. Average commute times to downtown from the Atlanta suburbs hover in the 45-minute range, according to a study published by Drivemode. Compare that to a drive time of 20-minute or less outside of rush hour for residents of Sandy Springs, Smyrna, Brookhaven, and Mabeltown; and even less for Decatur, East Point, College Park, and Forest Park residents. Commuting by mass transit from the outlying areas takes just under an hour, regardless of rush hour. The area surrounding Emory University, a 15-minute drive to the Northeast from central Atlanta (35 minutes on mass transit), boasts another group of the area’s top employers. For starters, there’s Emory University, located in the Emory Highlands and Emory Village neighborhoods. Then, there are the Centers for Disease Control and Prevention, Children’s Healthcare of Atlanta, and the headquarters of SunTrust Bank located nearby. Because Emory is outside the downtown area, travel times from most parts of the city to the area are considerably easier, as commuters are moving against the flow of traffic, or subverting it entirely. Drive times from Sandy Springs, Brookhaven, and other North Atlanta suburbs and neighborhoods are under 20 minutes, while commuters traveling from South Atlanta suburbs and neighborhoods face commute times of around a half hour. There are many large employers located in the suburbs of Atlanta, as well. For example, AT&T has their corporate offices in the area between North Buckhead and Brookhaven. The Northside Hospital between Dunwoody and Sandy Springs is also one of the areas largest employers, as are Cox Enterprises and the headquarters of the United Parcel Service (UPS), who also call Sandy Springs their home. Commute times to Sandy Springs, Buckhead, and Dundwoody-area employers are almost non-existent (under 15 minutes) for residents of north side neighborhoods and suburbs, while residents of central and south Atlanta face commutes in the 20- to-30-minute range. Lastly, there’s another cluster of major employers located in the Vinings, Smyrna, and Cumberland area, northwest of Central Atlanta. The Home Depot has its headquarters in the area, for example, as does Piedmont Healthcare. Just as is the case with the other Northside employers mentioned above, commute times to these major businesses are under 15 minutes for residents in area neighborhoods and suburbs, and under 30 minutes from just about anywhere else in the city.